A published photojournalist, Holly expresses her creative spirit through the camera lens. As a storyteller at heart, Holly crafts photo series that intertwine personal and professional experiences into pictorial anecdotes. In her role as Elemental Impact (Ei) Founder & CEO, Holly travels for conferences, tours, meetings and other business engagements. When practical, Holly arrives in the city two to three days early for urban exploration with her camera. Often the photos are the basis for articles in the Ei on-line magazines, Regeneration in ACTION and The IMPACT, and /or in print media. An industry pioneer, Ei’s important work sets the foundation for establishing sustainable standard industry practices. Documentation is essential for template creation and replication. Complementing the Fingertip Press, Holly’s Images provide the visual format for “telling the story,” giving the Ei Pioneers credit for their successes, and time-stamping accomplishments. Holly Elmore Images FB Albums – Holly Elmore Images are organized by subject, ranging from nature photography to travel photos KSU Leto supporting images for Fingertip Press articles. Albums include Industrious Bees, Inspiring Butterflies | Moths, The Magical World of Bugs, The Power of Pollinators, Summer Flowers, Fall | Winter Flowers, Delightful Dahlias, Colorful Zinnias, Grasses & Cover Plants, Spirals of LIfe, Microcosms: worlds within worlds, Shoreline Birds, Mighty Herons, Majestic Trees, KSU Leven School of Culinary Sustainability and Hospitality, Food Photography, Community Gardens, Farm Scenes, Farm Fresh Produce, Kaula Lumpur, Malaysia July 2018 Visit, Asian Wet Markets, Street Markets & Festivals, Urban Buildings & Structures, City Skylines, and 2017 Cuba Cruise. FB posts often contain interesting anecdotes related to the image and | or wisdom from the Heart. If interested in purchasing a photographic print, visit the Photo Print Purchases page. The Holly Elmore Published Images lists photographs published in various print mediums. The Ei FB Albums include comprehensive albums documenting conferences, meetings and events. Within albums, images are organized in chronological sections and each photo has a unique description along with individuals identified when practical. Albums contain an overview description along with links to related Ei Blog articles. In addition to albums designed to support an Ei Blog article, several albums document an Ei industry focus. For example, the Ei Plastic Film Recycling album is a comprehensive 150+ photo album chronicling Ei’s pioneering work in commercial plastic film recycling from the first action steps in 2011. With over 200 albums, the Ei FB albums are a valuable industry resource. Photos are available for download from the FB albums and are often used in industry-related presentations and published studies. Ei requests a donation for photo use, especially for media placement. The @ Your Service page details image and documentation services available. The Fingertip Press page contains an overview of Holly's published articles, whether in blogs or in print, as well as industry documents. 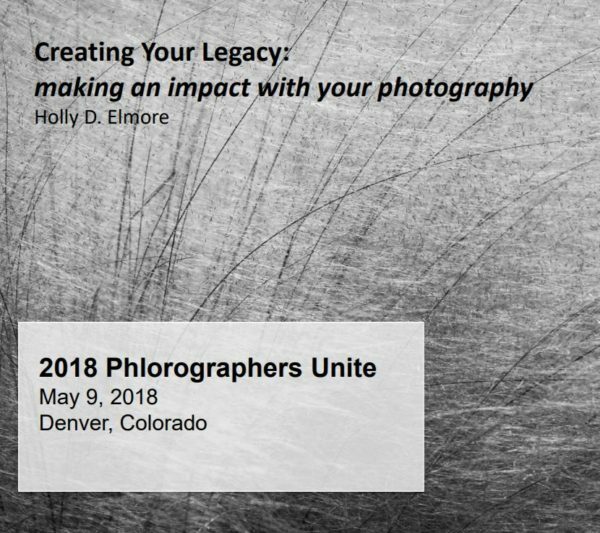 The Holly Elmore Images page showcases documentation through images. Holly Elmore is available for contracted services. The @ Your Service page gives the details.